New York: The Museum of Modern Art, 1999, n.p. The filmed drawings, or drawn films, of William Kentridge inhabit a curious state of suspension between static to time-based, from stillness to movement. These "drawings in motion" undergo constant change and constant redefinition, while the projection of their luscious charcoal surfaces somehow retains an almost tangible tactility. Smoky grounds and rough-hewn marks morph into an incessant, though not seamless, flow of free association that evokes the fleeting hypnagogic images that precede sleep. Bodies melt into landscape; a cat turns into a typewriter, into a reel-to-reel recorder, into a bomb; full becomes void with the sweep of a sleeve. The allure of Kentridge's animations lies in their unequivocal reliance on the continuing present, in the uncanny sense of artistic creation and audience reception happening at once. 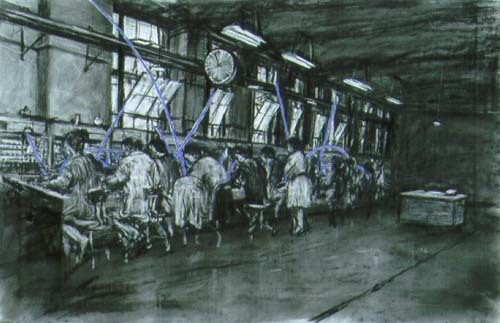 Kentridge's films owe their distinctive appearance to the artist's home-made animation technique, which he describes as "stone-age filmmaking." Each of his film-related drawings represents the last in a series of states produced by successive marks and erasures that, operating on the limits of discernibility, are permanently on the verge of metamorphosis. The animations are painstakingly built by photographing each transitory state, as traces accumulate on the paper surface, each final drawing a palimpsest containing the memory of a sequence. The result is a projected charcoal drawing where the line unfolds mysteriously on the screen, with a will of its own, the artist's hand unseen. In the 1950s, filmmakers Stan van der Beek and Robert Breer's time paintings sought to document the creation of paintings on camera. But rather than relating to this moment in film history that looks to performance and kinetic art, Kentridge's films evoke the late silent cinema of Russian and German Expressionism, most directly in the predominance of black and white, the absence of dialogue, and the use of intertitles. Kentridge lives and works in Johannesburg, where he was born in 1955, into a South Africa ruled by a repressive conservative state. Describing his childhood background as "a comfortable suburban life," he sees himself as "part of a privileged white elite that has seen and been aware of what was happening but never bore the brunt of the might of the state. "1 His films are deeply affected by the landscape and social memory of his birthplace, and allude to his country's struggle to overcome the divisiveness of apartheid. Embedded in the events which unfold as Kentridge's marks materialize is an undercurrent of references, accessible in varying degrees depending on the viewer, to his country's contemporary social history. "I have been unable to escape Johannesburg. The four houses I have lived in, my school, studio, have all been within three kilometers of each other. And in the end all my work is rooted in this rather desperate provincial city. I have never tried to make illustrations of apartheid, but the drawings and films are certainly spawned by and feed off the brutalized society left in its wake. I am interested in a political art, that is to say and art of ambiguity, contradiction, uncompleted gestures and uncertain endings. "2 Kentridge's work has always avoided the prescriptive approach of propaganda, drawing on uncertainties and vacillations, particularly since the abolition has dissolved previously clear-cut oppositions. Kentridge's animated film, Stereoscope, is the eighth in a decade-long series featuring the same evolving character, Soho Eckstein. A possible surrogate for the artist, Soho also suggests the archetypal businessman, for he can always be identified by his pin-striped suit. The stereoscope is a device which makes images appear three-dimensional by presenting each eye with a slightly different point of view of the same scene. In attempting to reconcile the difference, the eye is tricked into seeing volume. In Stereoscope, the artist employs a reversed maneuver, where the use of a split screen device can be seen to dismember three-dimensional reality into complementary but unsynchronized realities. In the following interview made on February 22, 1999  on the occasion of his exhibition at The Museum of Modern Art, New York, held from April 15 to June 8, 1999  William Kentridge discusses the making of Stereoscope and its relation to his other films. Lilian Tone: Even though you have worked in a number of different mediums like film, printmaking, theater, and opera, your work seems to have always been very much rooted in your drawing production. How has the transition from a static medium to a time-based medium impacted your work? 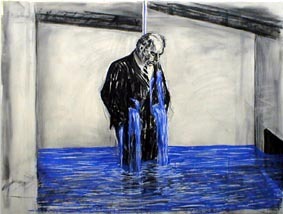 William Kentridge: I have been aware when making drawings that there was often a middle stage when I was drawing most fluidly, with the greatest certainty. And that often at the beginning and, at the end, a tightness would creep in. Initially, I was photographing the stages of making the drawing, filming it coming into being. I was trying to chart the imagery that went through it, a narrative that would develop through the drawing. And once I saw what the drawing did, and how it could not change, the idea came of actually structuring the narrative using several drawings. That was twelve or thirteen years ago. LT: What was your film background prior to your first film of the Soho Eckstein series made in 1989? WK: I had made home movies, and even made crude animations using an 8-mm camera. But it was in the mid-1980s that I worked for several years as an art director on really bad South African television and feature films. From those I got some idea of an imperfect grammar, a sense of the way in which you could construct a drawing on the same principles that you would design a film. Put the lighting wherever you want, change the perspective, the shape. Not be constrained by the normal demands of naturalistic perspective, space or lighting. LT: In this exhibition, on view along with Stereoscope are drawings that went into its preparation. How do your films relate to the drawings made for them? Do you consider the drawings subsidiary to the films, or are they interdependent? WK: The films started off initially as a way of examining the drawings, but then the narrative element came in, and the drawings were at the service of the film. The first Soho Eckstein film was a very distinct practice from the activity of making drawings, which I was still doing. It was only after several years of making films that I showed any of the corresponding drawings as drawings. The drawings and the films interrelate in two ways: first, the drawings are the leftovers from the making of the films. There are not thousands of drawings, only 20 to 40 different ones, whatever is left at the end of a major sequence. Secondly, the actual demands of the film, its actual narrative, bring into being a whole new set of images that I would never arrived at otherwise. This is true not only in terms of subject matter but also in terms of surface, since they are worked on quite quickly; they have to be done at a certain speed. And, because of their use in the films, the drawings contain the traces of the whole progress of each sequence, for a lot of rubbing out and ghost images are built into them. The film, the complication of making the film, becomes a way of arriving at a set of drawings. LT: When you first told me about your ideas for Stereoscope, you were not sure if you would be using your usual characters, or any characters, but later somehow Soho made his way into the film. How have the characters of Felix Teitlebaum and Soho Eckstein evolved over the past ten years? and Wanting, I understood Soho and Felix much more as two different sides of one character rather than two fundamentally different characters. LT: How much of Stereoscope did you have in mind before you began to draw? WK: Stereoscope had an uncertain beginning. There were several images that I knew I wanted, but I was not quite sure how they related to each other. It took several months of working on the film to understand how they would finally come together. I had a section of the film that had to do with a vision of points of connection and disconnection, in which the work of Mayakovsky was an influence. I always wanted to do a production of "Vladimir Mayakovsky: A Tragedy." I think Stereoscope is the closest I have come to that. To that vision of the city. I also knew that I needed a very full room and an empty room as the key components of the film, and it was quite clear that the full and the empty room had to do with the sense of disquiet that I was feeling, ranging from feeling very overcrowded in the world to the world feeling very empty. LT: Looking back at your eight films, do you detect any threads, do you see them following one another? WK: I see them unable to get away from the same thing again and again. That is always the difficulty. I think I am making a different film, and suddenly I realize I've used the same ideas again. In retrospect, maybe one cannot draw a very clear line between them. What is clear is that there are different moments of South African political unfolding which seemed peripheral to the projects while I was making them, but which on looking back seem very much the theme that runs through them. I am not quite certain what the political moment is around the current elections. It feels like a time when politics is taking a backward glance. LT: Your background combined with the socially engaged overtones of your work invite a primarily political reading, which is reflected in the literature about your work. WK: The political process is one element of the films, but for me there is often a big disjunction between what people see as the core of those films, and what I was thinking about when making them. But that is not to say that what I am thinking about when making the films is what is there when they are finished. I am thinking about what I can do with this extraordinary blue pastel that I brought from London, but that is not a question that somebody asks when they are watching it after the event. It also has to do with various sets of meaning that I have to take responsibility for. Some people give a quite narrow political reading and say this corresponds to this moment in South Africa. But I think there are other people who do say that the films are about space between the political world and the personal, and the extent to which politics does or does not find its way into the private realm. LT: My impression is that your films have become more associative and ambiguous. WK: Yes, I think so. And in a way I hope so, but it is not intentional. Sometimes they seem to have to continue a social saga, but that is not how they started out, and it seems a dangerous way to try to lead them. I think it has more to do with changes in myself. Things that seemed more certain eight years ago seem less certain now. Politically, it has certainly become much more complex. South Africa is a whole different political place, certainly less interesting to the outside world, but more complicated for people inside. LT: Would it be fair to say that increasingly, and particularly in your recent work, after Felix in Exile, the political events in the film are "sieved" through your personal life, as events from your internal mindscape? Johannesburg, 2nd Greatest City after Paris, in comparison, was more impersonal. WK: Yes, but Johannesburg was very much the first attempt at finding a language, trying to discover what animation did. The fact that one can make a crowd move across a sheet of paper, that was the miracle. Whatever worked would earn its place in the film. LT: Last year, one of the first things that you said to me about Stereoscope was that it was "a portrait of Johannesburg, like the rest of my work." WK: As the film progressed, it became less a portrait of Johannesburg than I had anticipated. I thought it would be a slightly larger scale, but the actual city has perhaps become slightly more claustrophobic. There are lots of drawings of the city, the specific buildings, the roads, the kinds of architecture. There is a sort of feeling of being through quite a journey at the end of the film. There is a section called "Chaos in the City" which has to do with the city falling apart, which is more a way of understanding the violence between the two rooms. While some images of civic chaos are from Johannesburg, some are from Kinshasa, some are from Moscow, and one is from Jakarta. All the images of cities in chaos are from the week I was doing that sequence. That week there were riots about the ruble in Moscow, rebels being thrown over bridges in Kinshasa, students protesting in Jakarta, and cars being held up in Johannesburg, so it was a mixture which relates much more to Soho's internal conflicts than to an objective portrait of the city. LT: After you told me that you were working from photos found in archives of Johannesburg in the 1950s, I realized that also, in your other films, objects and architecture often seem to date back to that period. WK: I think there is a preference. I am trying to think why, when I draw a telephone, I draw a Bakelite telephone and not a cellular telephone. I think that a lot of my work is trying to mine a childhood set of responses to the world. The first time you see a picture of violence there is a kind of shock that you don't get once you've seen thousands of pictures like this on television. There is an element of trying to go back to an earlier stage, of trying to recapture the sensitization, and I think part of the images of drawing backwards in time has to do with trying to capture a different way of seeing. LT: You said that you start the films from the center outwards. What was in the center of Stereoscope when you started? WK: I wanted a sense of transience, of a city bustling, telegraph wires and power stations. Early on I knew that it would involve lines of communication, telephone switchboards. The idea of the stereoscope, of the double room, came quite a lot later. It is interesting that although "stereoscope" is mentioned specifically by name, and is implicit in the images on screen, there is no image of someone looking at a stereoscope. I bought many stereoscopes while I was traveling, so I could do a drawing of someone using one. LT: Somehow the stereoscope here works as a surrogate for the camera. Like the X-ray, the theodolite, the M.R.I., the cat scan, other instruments that have appeared in your films, which represent different ways of seeing, different ways to represent the world. WK: I had not thought of it that way, I think you are right. The ways which already existed in the world of saying "this is a way of understanding the world through a representation." And an actual X-ray or M.R.I., again, is one way, and the stereoscope is another way to understand the world. LT: But there is also a mental operation in stereoscopes, the idea of two flat images that are slightly different, slightly out of sync, that the brain brings together into a single three-dimensional unity. WK: Yes, the cat goes through a whole season of transformations. It is sort of saying "this is the same world"  any character, or event, or situation, you see in an earlier film automatically gets right of entry into the current film. LT: Also the room filling with water. You said that it was an image that you wanted from the beginning. WK: When I was doing it in this way I had forgotten that there had been moments in Johannesburg, and Sobriety, Obesity, and Growing Old. And I'd completely forgotten about Felix's room filling with water until you mentioned it. But I had also thought of this not so much as a room filling with water but as an image of Soho leaking. LT: Does the "Give Forgive" neon sign at the end play a specific role in the narrative? Of course, it inevitably brings to mind the hearings of the Truth and Reconciliation Commission. WK: I think it does. The relationship between the words give and forgive, what you have to give to be forgiven, as if forgiving is a gift that is being demanded of someone... In a way, there is a constellation of uneases around those two words, and it was that, rather than any clear meaning, any clear purpose, that suggested that those words should be in the film. "Give Forgive" was associated with the film early on. At one stage it was in the middle of the film, and I didn't understand what it was being said in response to. And I suppose, at the end, the film cannot find a calm, and "Give Forgive" is another way of asking for a peace, a stillness and a calm. If the choice has been shattered between the two rooms, what space is between them, what kind of viable way can there be? But I couldn't tell you if it is Soho who is being asked to forgive, or if Soho is asking the forces around him to forgive him. 1. Kentridge, quoted in Roger Taylor, "Memento Mori," World Art (Melbourne), (May 1997): 48. 2. Kentridge, quoted in William Kentridge: Drawings for Projection, Four Animated Films. Johannesburg: Goodman Gallery, 1992, n.p. All illustrations: Drawings for Stereoscope. 1998-99. Charcoal and pastel on paper. Courtesy the artist.